It’s been nearly two weeks since Heart of Thorns came out; bugs are being fixed, things are settling, adjustments are being made. But there’s one thing that’s been bothering me, and it’s something that Ravious touched on earlier today. Masteries. Or rather, how they’re gained. Put short, experience gain is something that needs rebalancing, in light of the new state of the game. Before, experience meant nothing. It wasn’t important. You didn’t need to grind out a ton of xp to level up – sure, you could if you were impatient, but it wasn’t necessary. You could hit 80 in a reasonable amount of time by naturally playing the game. Now we suddenly have a new game mechanic where experience is absolutely the most important thing ever. 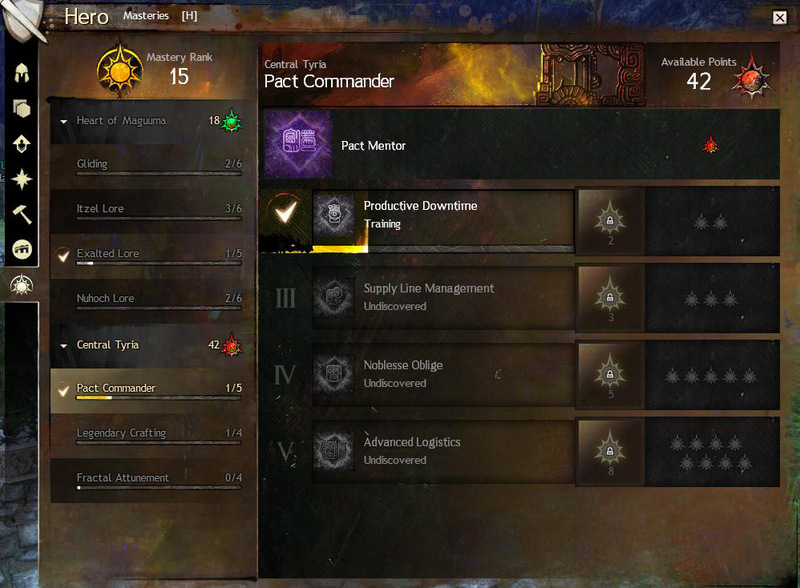 I haven’t been doing much in core Tyria since launch, clearly. It’s a pretty big shift for the game. And it does make some issues rather obvious – mainly that xp gain is incredibly imbalanced in this game, with certain sources giving more than others. On one hand, for example, basically everything grants experience. Gathering, reviving someone, exploring, doing events, completing hearts, killing enemies. The new adventures give a good chunk that can be re-earned daily. But there are some curious discrepancies as well. 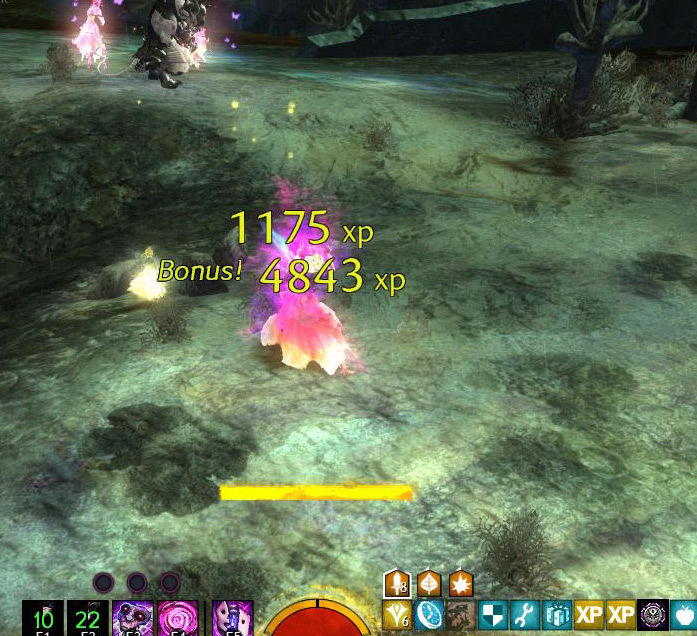 Dungeons, for example, are a good source of experience – at level 80 you get about 77k xp at the end for completing the dungeon. On the other hand, fractals grant very, very little experience – you will not be able to make any appreciable progress on the Fractal Attunement mastery, for example, while playing fractals themselves. Events used to be gold for getting xp – getting the gold reward on an event grants about 18k xp. The current version of Experience Boosters actually will boost xp from things other than kills, which is great! It makes events worth ~27k xp each, which is a decent chunk of experience there. Or at least, it seems to be, until you look at two things. The amount of xp needed for mastery tracks, and the amount you can get from a specific other source. For example, I’m currently working on Pact Commander in Core and Exalted Lore in Maguuma. For Pact Commander I’m primarily after the third tier, to unlock the daily merchants. I’m about halfway through the second tier – I need about 2.91 million experience to complete the second and third tiers. The equivalent of about 108 events, with the 50% boost to event xp. Here’s the thing, though. Kills – previously thought of as not very useful for leveling – are way more efficient than events for gaining xp right now. There are so many experience boosts that only apply to kills, and when you pile a bunch on and seek out mobs that have been alive for a while…well, it adds up fast. I don’t even have every booster available on, but 5-6k or more from a single kill is not a stretch. An average of five kills can equal a single event. Is it just me, or does that feel really imbalanced to anyone else? I mean, sure, when you’re doing events, it’ll speed up your xp gain significantly (with some exceptions but I’ll get to that), but I have to say it bothers me that tracking down long-lived enemies and killing them is more efficient than events. It feels…weird to me. Killing enemies being such an efficient source of experience is what has led to people farming Citadel of Flame’s endless spawns for vast amounts of experience in short periods of time. But here’s the bigger problem – not all enemies actually grant experience. Spawns from certain events, or enemies within Living Season 2 and Heart of Thorns story steps, for example. It was certainly frustrating to be working on story steps and not be able to make any appreciable dent in that xp bar. The writs of mastery you get for completing a step the first time help, but I would have preferred to be getting xp as well while actually going through the missions. What’s the solution for this problem? Well, I’m not really sure. There’s a few ideas, but all have their issues. Rebalancing the amount of experience gained from various sources can potentially make leveling more difficult for newer players…or trivialize it even further. I like that the new versions of experience boosters give extra experience from all sources, not just kills, but at the same time I feel like it skirts the line between “convenience item” and “gives an actual advantage” a bit too closely. Perhaps adjusting some of the other boosters obtainable in-game (such as Celebration and Birthday Boosters) to give a boost to xp from all sources instead of just kills would help alleviate that. Definitely increase the gain from fractals – add a flat reward (maybe based on reward level) gained upon completion. Perhaps boost the amount of experience gained from participating in events at level 80. 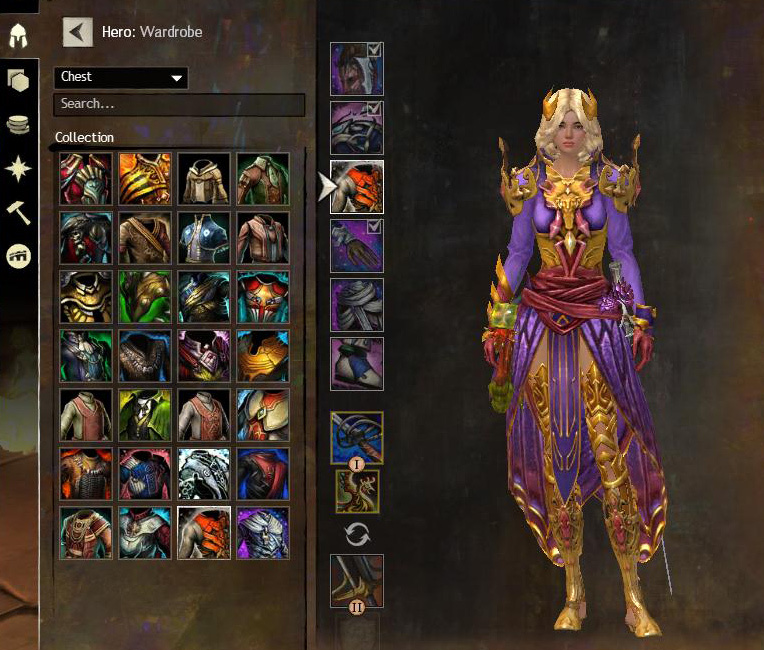 Leveling masteries feels more like a grind than anything else in the game. I do understand that it’s meant to be a long-term thing, but considering how many things in the game are gated behind getting these leveled up, experience is something I really feel needs to be looked at and tweaked. Well, folks, it’s finally here! It’s been a long time coming, but Heart of Thorns is releasing tonight. Just under 16 hours from now, we’ll all be taking our first permanent steps into the Verdant Brink. No more beta characters that’ll have their progress reset when the weekend’s over. This is it. I had grand plans of writing up things to do in order to prepare for the expansion launching but…not only have others already done that (and I may or may not agree with their advice), the end of this month feels like it just snuck up on me. Even now it feels almost surreal that today is October 22nd, tomorrow is October 23rd, and Heart of Thorns goes live tonight. The past two months since PAX Prime and the announcement of the release date have simply flown by. I’m going to need to find that waterfall. …have fun. Savor it. 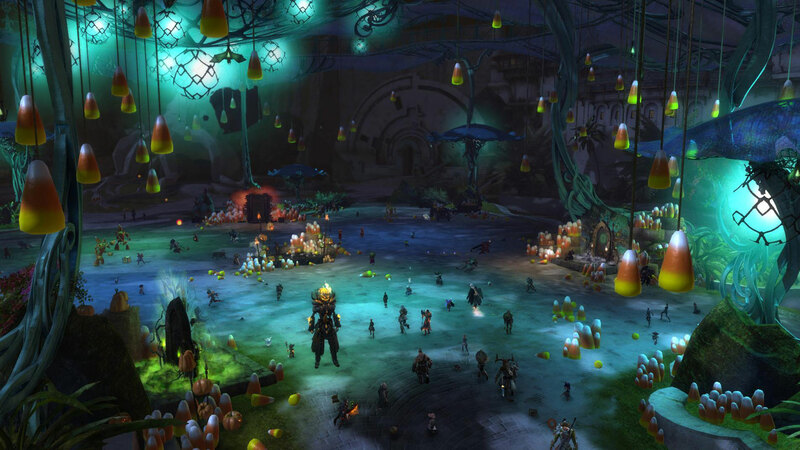 An expansion launching is not something that happens every day, especially one that adds so many new systems that fundamentally change the game, and especially not one that coincides with what’s likely the most-loved festival in the game. There’s going to be so much to do, so much new stuff in just a few hours. Enjoy it. Take your time. Don’t forget to eat and sleep. Report bugs that you find. And it got me thinking. Which one would I prefer? Previously, I had generally been on the side of “later but better”. For example, the base game itself had taken forever to be released. I know, ArenaNet tends to work on a “when it’s ready” schedule, and they didn’t want to release a game that was unfinished, but it still was a very long time from announcement to release – several years, the sort of timespan that generally means death for a game. It was made bearable, though, because of the fact that ANet was also being very transparent about the production process, and giving us a constant stream of info. The info was more spaced out, of course – if I remember correctly, the pattern for most of the pre-release period was “big bit of info every six weeks”, about – but it was consistent. We knew that every few weeks, we’d get more stuff announced, and as the game got closer to completion, the amount of info that was released picked up consistently. What we are facing now, and have been for several months, is a drought, with the occasional small rainshower. The parched ground quickly absorbs the rain, but it’s not even close enough to break the drought. Heart of Thorns was announced at the end of January. We have gotten some info since then, but it’s been inconsistent. Several weeks of elite specializations in a row, and then nothing. Guild halls were announced with prepurchases last month. Yesterday the Shiro legend for revenants was teased. It’s the weeks of radio silence, coupled with short bursts of small bits of info, that get wearying after a while. Combine that with the fact that we actually know very little about what we’re getting in the expansion, and it’s understandable that people are losing patience. Now, I’m not one of those people who have somehow come to the conclusion that “three biomes” means “three maps are ALL THE GAME CONTAINS”. But it would be nice to know a bit more about HoT. What are the remaining specializations? What new legendaries are we getting? How much new map are we getting to play with? Not even how many new maps in total, but just an idea would be nice. What kind of group content will we be seeing? These are the things that people want to know. These are the things that we aren’t getting. And with how much they’re stretching out the info they are giving us, it’s not making me hopeful for the expansion to release any time soon. Back in January, at announcement, the most popular speculated release date for HoT was late August, to coincide with the base game’s birthday. August 28th is in a month and a half. The chances of it coming out then are currently extremely small. 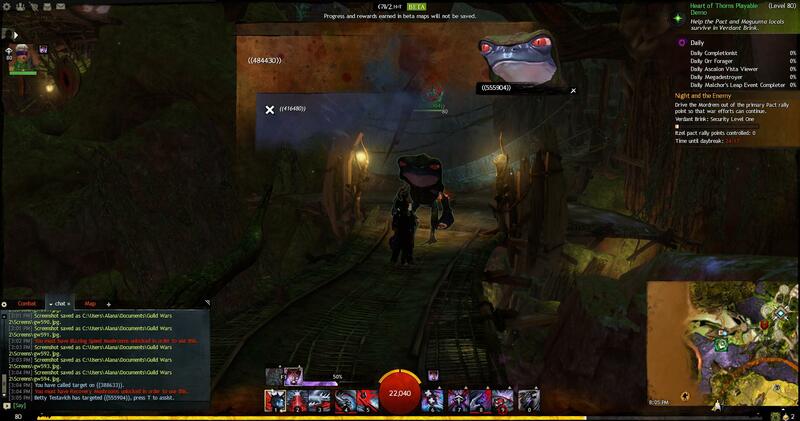 The info drought is bad enough, but then combine it with the content drought in GW2 itself. It’s been six months since the last real content we’ve gotten. I don’t expect a whole lot, since most of the effort is going to be on the expansion, but something to do would be nice. It’s July – where’s Dragon Bash? Festivals are always fun. It wouldn’t be new content, but it’d be something. 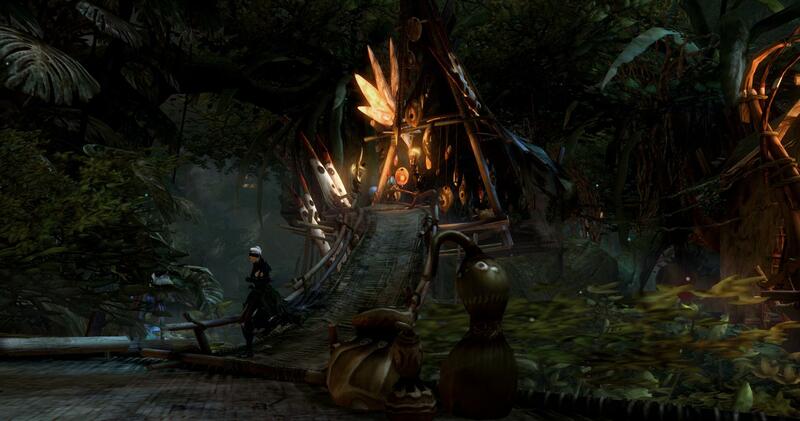 For that matter, it’d be nice if they did something like just open up the Pavilion in Divinity’s Reach indefinitely. It’d be a change of pace, and then we’d also have the Gauntlet to play. And, sure, the Gauntlet is old content. However, the changes to traits would effectively make it new content, since most of the things that used to work there (particularly against Liadri) very likely would not any longer. 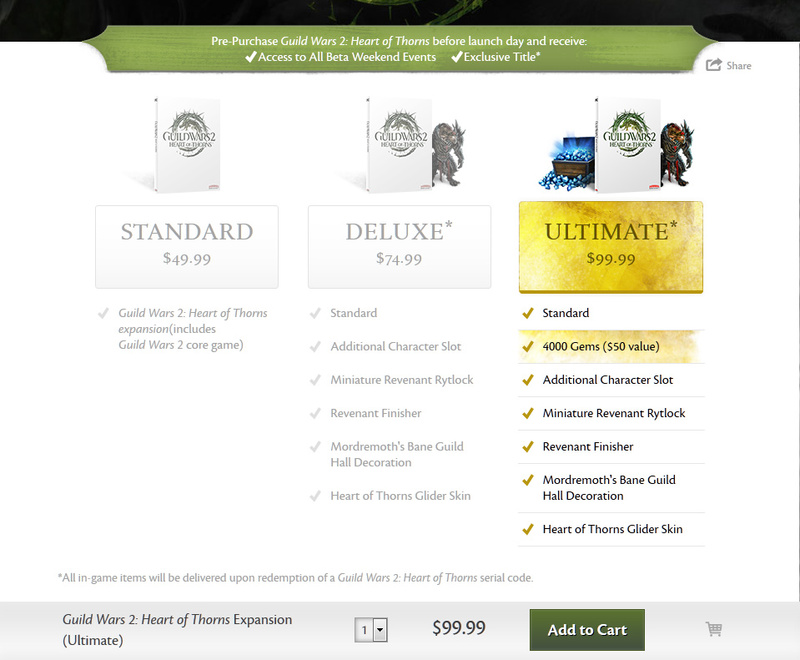 I’ll be fully honest – I don’t play GW2 much right now. I have done basically everything available in the game more times than I could count. I have 16 characters at level 80 – two of each profession, which was my goal for HoT. I’ve done more than my fair share of dungeons and fractals. I don’t especially enjoy events like Tequatl and Triple Trouble. Silverwastes can be fun, but I’ve farmed it too much and have no desire to do so anymore. Most of the legendaries I like, I’ve made, and I don’t want to work on a new one with the changes coming. There is essentially nothing to do, and as such I generally only log in to get my daily rewards and, if I remember to, gather in my home instance. So, while a few months ago I’d say “release later and be more polished”, at this point I’d rather HoT be released sooner, but be a bit rougher around the edges. We need the deluge to end the drought, and at this point, I don’t think anything short of the expansion’s release will do it. There’s only so much nothing that we can get and still have patience, and by now, I think I’d rather have something to actually do, imperfect it may be. And if we aren’t getting any sort of content in GW2 itself, that leaves the expansion. Please, just give us something already. 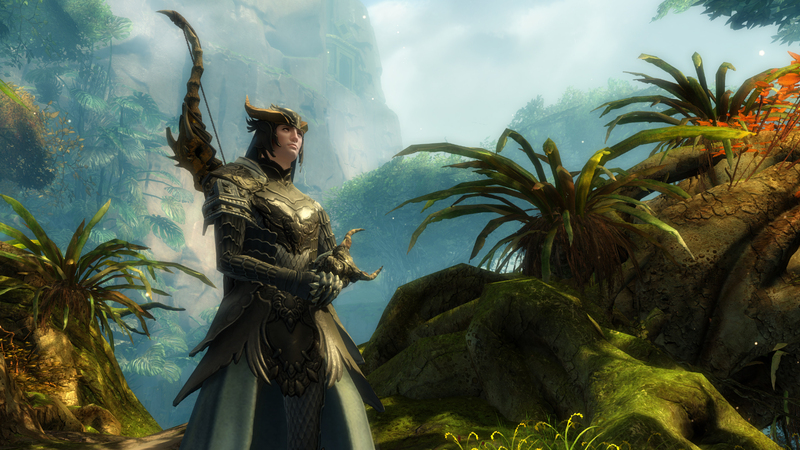 Today is a Heart of Thorns beta day, and the first play session of the day just ended. This was my first time trying anything from HoT, and I do have to say I enjoyed what I played. My beta Revenant, since only humans are available. Revenant is very clearly unfinished, but I did like what is available a lot. The first half hour or so I mostly stuck with hammer and Jalis, though I actually like mace/axe and Mallyx better. I do have to say I miss weapon swapping, and I feel like changing the utilities when you change your legendary stance isn’t quite enough. I did fiddle around with traits some, but as the whole current trait system is going out the window, I didn’t really look into what’s available too hard. 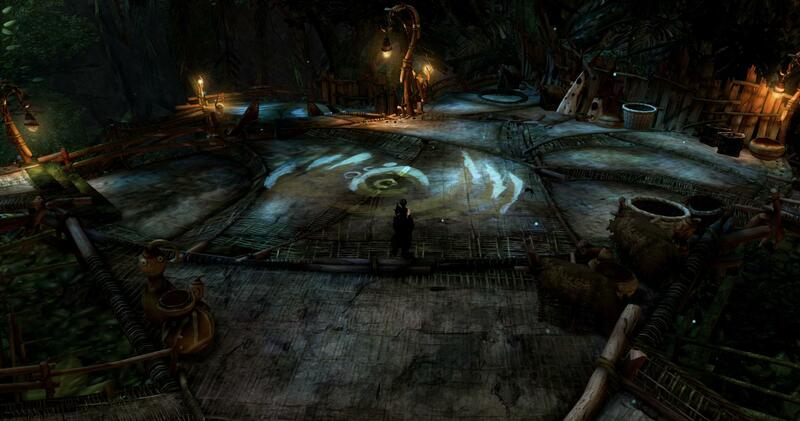 The map, Verdant Brink, is actually quite an appreciably-sized map. The verticality of it can be frustrating when you’re trying to get around, but it is very, very pretty. I especially liked the Itzel area. That would be Dak running right into my screenshot. The events on the map are definitely in the same style of Dry Top and Silverwastes, with a meta that cycles through, events to defend or take areas, and wanting a group for most of them. Dak and I tackled a rally point defense event with just the two of us, and while we succeeded, it was definitely a narrow victory (I was defeated and he was running in circles with next to no HP as it ended). Solo exploring is rather hazardous. The Masteries UI looks very nice – unfortunately I didn’t think to get a screenshot of it. Speaking of masteries, I do feel like activating them needs to be explained better. You need to have a mastery track activated in order to level it and spend points on it. At the top of each mastery category is a checkmark next to the name. Clicking that activates that mastery. This isn’t explained well and I only figured it out when someone mentioned it in map chat. I hope that they look into adjusting that to make it more intuitive. I also feel like much of the map felt pretty empty, however that’s not surprising considering that it’s currently far from completion. It isn’t even a lack of events, really; rather, there’s a serious lack of NPCs in most of the areas. This could be due to it being unfinished, or due to the fact that it was nighttime when I did most of my exploring, but either way. There’s a lot of room for them to work with there. I would have liked to play with masteries more, but I didn’t get gliding unlocked until towards the end of the test and didn’t have mushrooms unlocked at all. I did not come across anything noticeably broken (just minor things for the most part), and didn’t run into any performance problems while running around, which are both good things. I did come across quite a few things like this, however. It was just a short beta, so there wasn’t time to do a whole lot, and I decided to primarily explore. The next session I plan on diving more into the events, and want to try some of the ones to unlock outposts. There was also a few adventures I saw but didn’t activate, so I’ll have to give those a try, too. I did like what I played, and I’m looking forward to seeing how the map is when it’s more filled out and polished…and obviously, how the rest of the expansion will be! 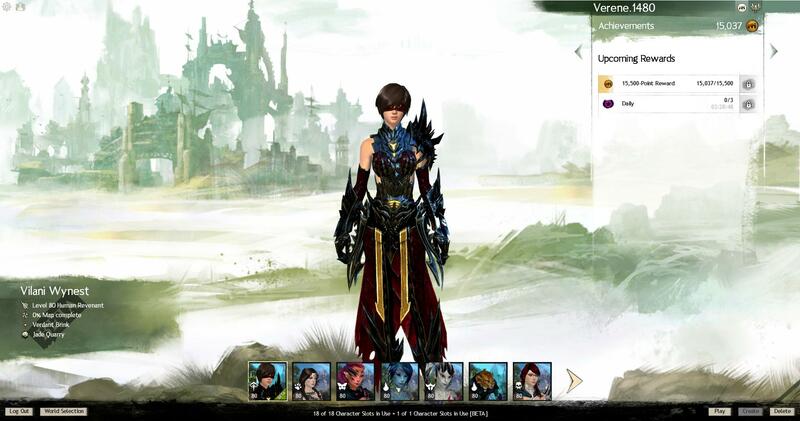 Last week I started writing a post about the newly revealed mesmer specialization, the Chronomancer. Note that I said tried – the post went nowhere; I spent an hour to only get down about eight sentences before I junked it. To be fair, I was also quite ill at the time. I’ve been meaning to go back to it and get something together again, but there’s been nothing. Which isn’t to say that I don’t find chronomancer interesting – the opposite is true. I think it looks pretty damn neat, in fact. I just have had no ideas as to what to write about other than rehashing the info we already have. In the meantime, the guardian specialization, Dragonhunter, was revealed. Dragonhunter has gotten a much more mixed reception than chronomancer did (which was overwhelmingly positive) – while I’ve seen a lot of people pleased with the info we were given on it, I’ve also seen a lot of “meh”. Personally, I actually think I’m more excited about the potential that dragonhunter has than I am about chronomancer. 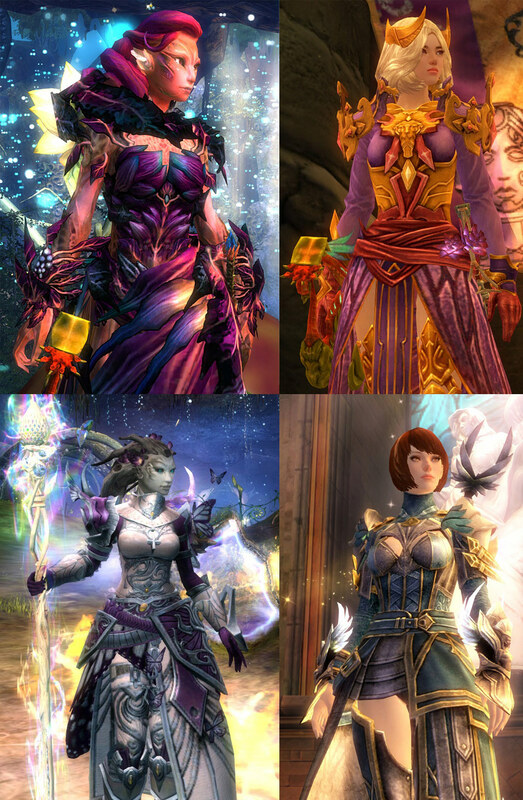 Above we have my collection of mesmers and guardians. 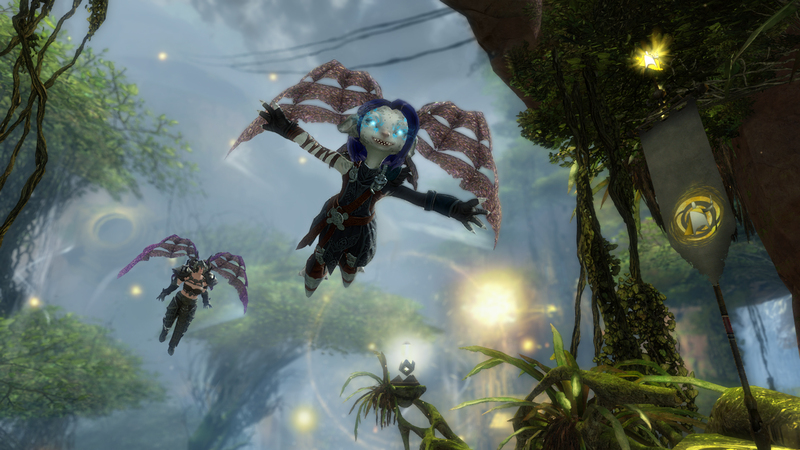 Liusaidh and Rosheen, the sylvari mesmer and guardian, are two of my most-played characters – Liusaidh is my main and was my first to level 80, and Rosheen was my second character I leveled. The humans are Haneul Nae (mesmer, descended from my GW1 ritualist) and Astrid Cheval (guardian, descended from my GW1 mesmer). They are more recent additions to my level 80 lineup, Astrid being the last character I leveled to complete my goal of having two of each profession at level 80. 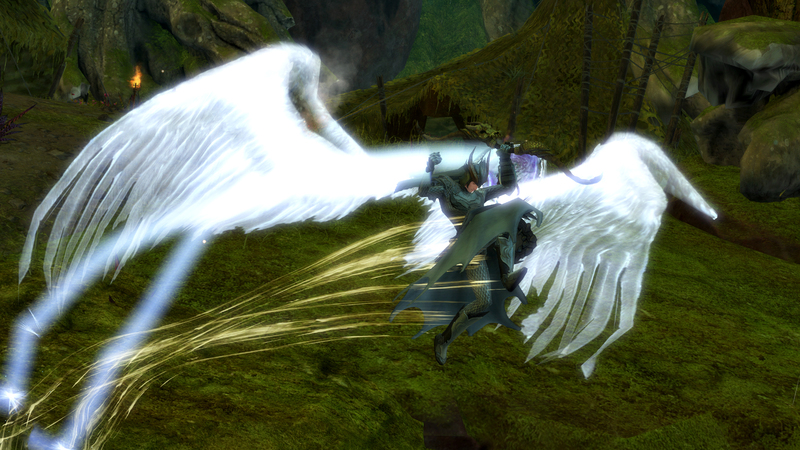 Liusaidh uses a phantasm build, whereas Haneul makes use of mantras. 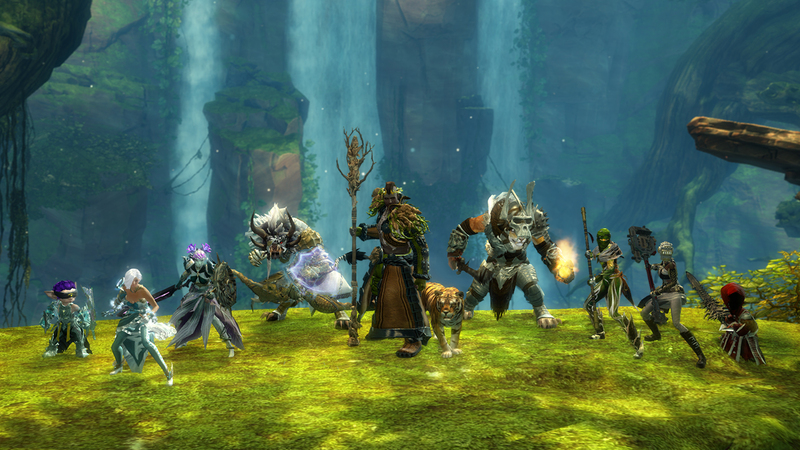 Rosheen makes use of shouts and boons to support, while Astrid whacks things with her greatsword. My original reasoning behind having two of each profession at level 80 was because of specializations. This was decided on long before we knew anything of how they were going to work, of course – I was most of the way to having 16 80s when Heart of Thorns was announced, and proceeded to level up another 3-4 characters in the months since it was announced. Now that we know that specializations are trait lines, I guess I didn’t really need to have doubled up like I did, but ah well. I enjoy leveling and making characters anyway. 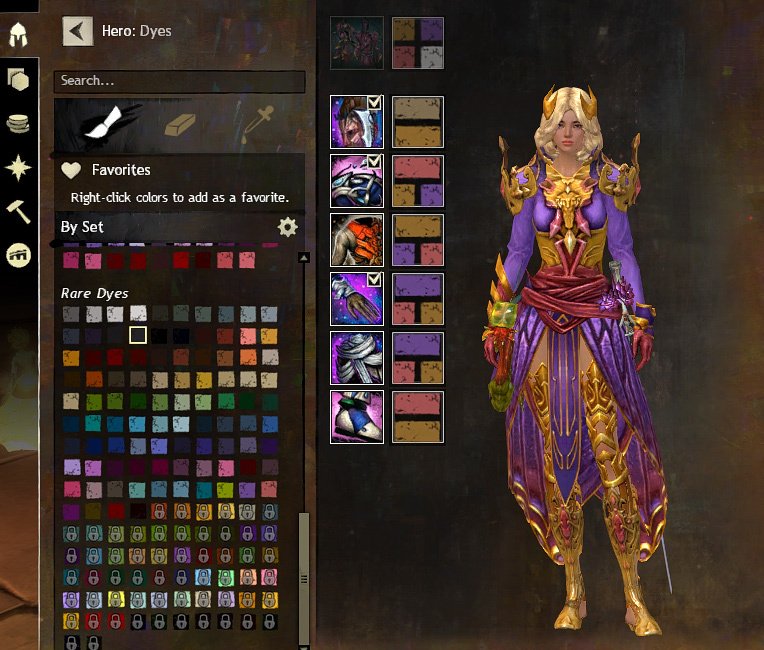 At any rate, I find myself not sure which of my two mesmers is going to become a chronomancer. Liusaidh is the obvious choice, as I play her the most – it makes sense to take my most-played character and give her the new skills and traits. There was also a trait mentioned on the livestream last week that will resummon phantasms when they’ve been shattered (so you essentially get a free shatter), which definitely caught my attention – that’d actually give me a reason to shatter my illusions. On the other hand, there’s the new weapon. Shield is cool and all, but I really love my focus. 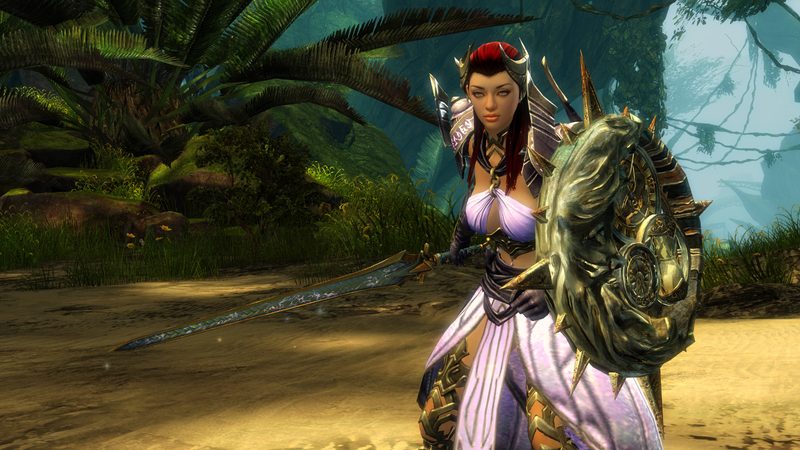 I had the idea of Liusaidh wielding a sword and focus as her main weapon set ages ago – long before GW2 was released. 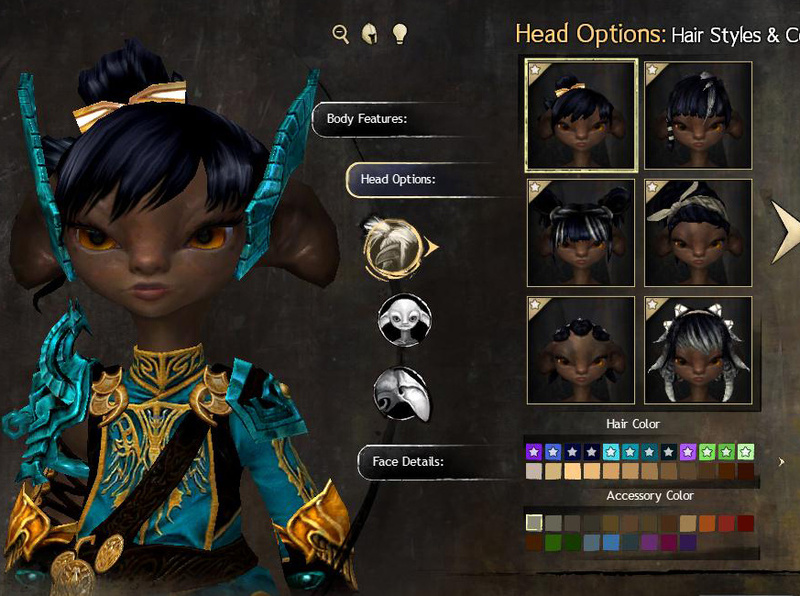 I made the Minstrel for her, and I can’t imagine replacing it. Haneul, then, may be better suited to become a chronomancer. 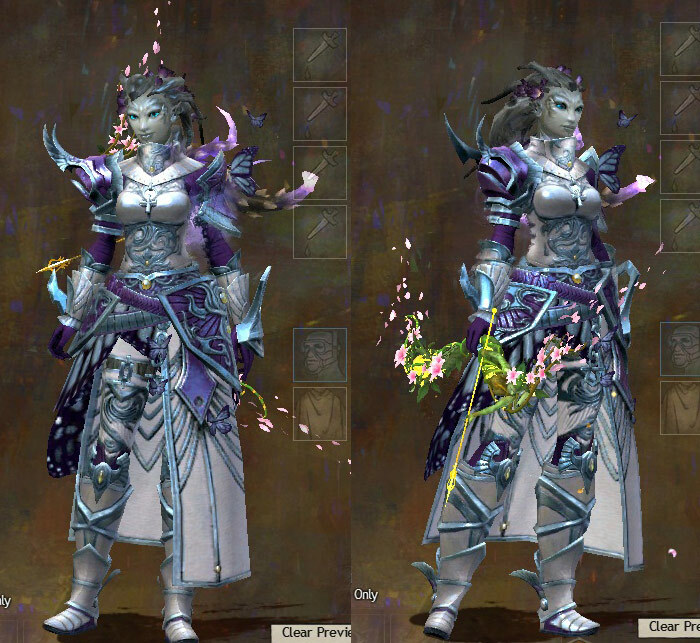 There are plenty of shields that go with her look – and I’d even consider making the Flameseeker Prophecies for her. It then comes down to, which do I like better? Mantras or wells? Whereas with dragonhunter…well. The choice was obvious. When the first teaser image was released on Monday, I had the thought that if I made Astrid into the specialization, I could give her Wings of Dwayna, which would perfectly match her look as a battle priestess of Dwayna. But when we actually got information about dragonhunter yesterday, there was no question at all in my mind – Rosheen was going to become a dragonhunter. No doubts about it. Not just because I NEED to give her Kudzu along with her Bifrost, but the new stuff that dragonhunter is giving us just fits her perfectly. I have, since launch, played Rosheen as a support guardian. Despite having never liked support roles in any other game before, I love support guardian. It’s just so much fun to play. Since stats are being disconnected from traits, her current boon duration build is going to be destroyed anyway, so I need to find something new to do with her. Dragonhunter will allow me to continue to play a support guardian, just in a different manner. And yes, I get it. Support’s not part of the current meta. I don’t care. I don’t care about what’s meta, what’s the most absolute efficient, whatever. I don’t find that fun, and that is what I find to be far more important when I’m playing. As such, what we’ve seen about dragonhunter actually appeals to my sense of enjoyment and fun, and changes up guardian, more than chronomancer does, for all that chronomancer looks flashier and more effective. I really like the idea of being able to support from the backline. To be able to use a well-aimed shot to deflect projectiles instead of being a Wall of Reflection bot. To have more range to play with. I like the more active virtues – the new Virtue of Resolve just plain sounds fun. And you know what? I even like the sound of traps. Two of the other common complaints about dragonhunter include the name and the fear that it’s a bit too close to ranger in how it works. The name…okay, I can understand that. It’s a silly, generic name. A lot of people were expecting paragon, which would have been neat, but realistically wasn’t going to happen. Paragon is already used synonymously with guardian in GW2 – it’s the name of the PvP achievement track for guardian wins. It also has a more angelic connotation to it, which the specialization, other than the wings in the concept art, does not have. In the long run, the name’s not going to be a huge deal. As far as the second…again, I can see it. Guardian is getting both a weapon and skill type that, while not unique to rangers, are best-known on them. There are differences in how the weapons work, though – on ranger, longbow is a high-power weapon that hits hard. I get the impression that the main use of longbow on a guardian is going to be to give a number of different supportive effects – we likely won’t be spiking enemies with a Rapid Fire analog. Right now it looks like traps do have a fair amount of overlap, but I imagine that dragonhunter traps will have more supportive utility to them than ranger traps do. 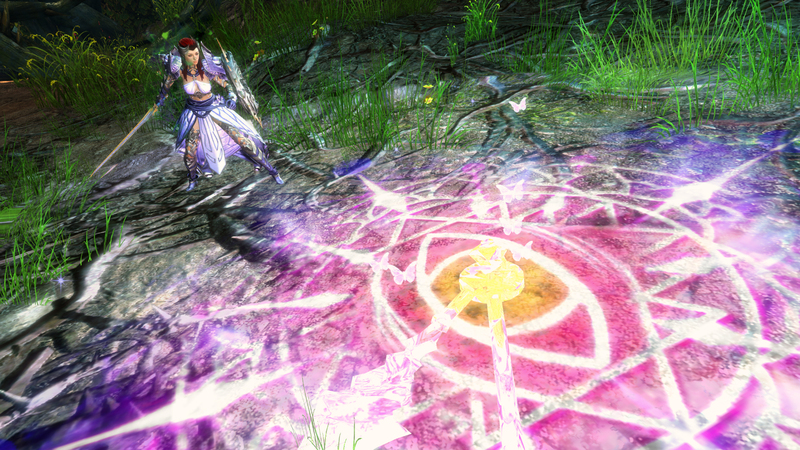 It’s similar to how mesmer is gaining wells through chronomancer – necromancer also has wells, but chronomancer wells will pulse three times with an end effect, as opposed to the five pulses that necromancer wells deal. The difference is slight, but it’s there. The Ready Up livestream today will, of course, give us more information about how dragonhunter will work, so it’s possible that some of the quibbles about it will be answered in about a half hour from now. But from a personal standpoint, I feel like dragonhunter is going to be more to my style than chronomancer, as it doesn’t require me to give up a build or playstyle I already enjoy. It instead caters to a playstyle I like. I wonder what we’ll get next? Specialization information was released last week, and I still don’t have my thoughts together on it enough to write a post (in short: I’m cautiously pessimistic about it), but today a new blog post went up – an in-game way to secure beta access for Heart of Thorns. The short of it is that, starting tomorrow for some unspecified period of time, items have a chance of dropping in Dry Top and Silverwastes that, when looted, give your account access to the next HoT beta. It’s certainly an interesting idea, in theory. The biggest thing about it is that it’ll be more likely to get a group of dedicated GW2 players than by simply picking from email addresses that are subscribed to the GW2 newsletter. However, it’s still an imperfect solution. The biggest problem is that it’s going to be entirely down to luck. There is no way you can work towards getting one of these beta-granting portals, than simply farming in those two zones and hoping you get lucky. This means that someone who has no idea about the beta portals will probably get one as a drop right away (I guarantee map chat in DT and SW will be full of people going “[(Beta Portal)] Uh what is this? !”), while others will spend long hours farming with nothing to show for it. Sure, email invites are largely RNG as well, but that is at least all behind the scenes, as opposed to actively working to try and get a drop and it never appearing. And I can tell you right now, it’s incredibly frustrating. Another problem is that the post specifies that “rare portals will drop from enemies”. First of all, there’s ArenaNet’s definition of “rare drop”. If something is classed as a rare drop by ANet, it means that if you see one, you probably should be off gambling in Vegas because you are an insanely lucky person. This game’s stinginess with rare drops is practically legendary. But, putting that concern aside, there’s another problem with the fact that they will drop from enemies. The vast majority of enemies in Silverwastes are infinite spawns generated by events, and hence do not drop anything. Ever. There are a few potential ways around that fact, though since the post specifies enemy drops there’s a few (event rewards, bandit chest drops) that really aren’t worth bothering with. Of ones that would be relevant to enemy drops, there is giving the portals an increased drop chance in Silverwastes over Dry Top; another is giving the infinite spawn enemies a temporary drop table that includes only these portals. 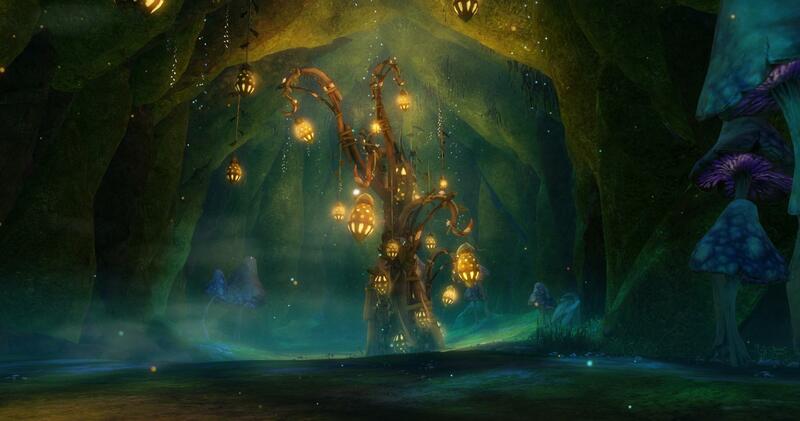 Of those two, I think the latter is more likely; if they do not do one of those however, then Silverwastes will be, well, a wasteland while this ‘event’ is going on. And as someone who really, really does not enjoy Dry Top, I’d much rather farm in Silverwastes for one of these. Ideally I wish that this was going to be done as some sort of time-limited collection. Collections are being used to gain all sorts of neat things lately, so it fits right in with that. And instead of relying simply on “play a lot and hope you get lucky”, it’s something you can actually work towards if it is something you are interested in doing. Then you definitely will have a beta full of interested players, instead of winding up with people who don’t really care getting access and people who do never getting to see it. A PvP reward track would also be an interesting way of earning the beta-access portal. Having both a PvP track and a collection, available for a short period of time (until just before the next beta, not for a day or two) would be the best solution, as that lets people who are interested have multiple ways of getting in. It’s worth noting that there’s no date for whenever the next beta will be, nor is is it specified how long these drops will be available. Maybe the definition of “rare” will be reworked to not mean “rarer than a snowball in hell”. We’ll see. On another note, ANet has teased that Mesmer will be the first specialization we’ll learn about, so I’m looking forward to that, at least! So, ordinarily I don’t like these sorts of things. But they can be fun, so why not? I was nominated by Tilion of Dragon Season for this. Basically a Liebster Award is a way to introduce yourself to your readers, as well as potentially introduce them to some other blogs they may not already know about.